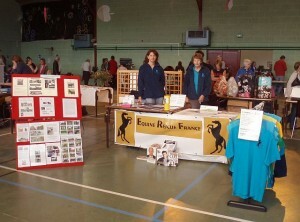 Home » Association News » The Etcetera magazine fete at Lessac…. The Etcetera magazine fete at Lessac…. We had a very worthwhile day out on Sunday at the Etcetera re-launch fete, where we got to meet some of our present supporters and also gained some new ones. It’s always nice to put a face to a name and to show some examples of how donations are being used. Despite the slightly chilly weather there was an excellent turnout with lots of interesting stands and car boot stalls to keep everyone amused. A huge well done must go to the editor Lorraine who managed to pull off such a great family day out. ERF are pleased to be writing a monthly column for the Etcetera magazine on equines (of course!) and all back issues can be read online. We would also like to appeal for potential fundraisers that could maybe run a fundraising event or have a vide grenier stand in aid of ERF to please get in touch with us.